1. 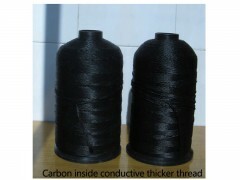 Excellent conductivity,anti-static. Such as: sensor, moist alertor,etc. 3. Black, white, and any other colors. 3. Can be used for special knitting conductive touchscreen Iphone gloves for touchscreen( capacitive cell phone) and sweater, string, etc.